I love the Earth Therapeutics line of tea tree oil products for the feet. I have used almost all of their products. Before a trip to Savannah, I happened to see these foot wipes on the shelf, and bought some to carry with me on the journey. Savannah always involves a lot of walking for me. There are many walking tours to go on, and it is just amazing being out in the historic district. shoes were, when I got back to the hotel, my feet would be tired and hot. 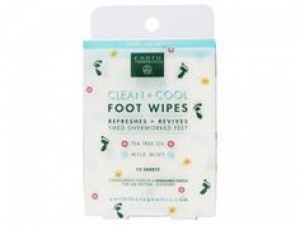 Since I love how the Earth Therapeutics soak makes my feet feel, and I knew the hotel wouldn’t be a convenient place for a foot spa treatment, I thought maybe the wipes would be a good substitute. I had some of the foot spray, but the wipes I could use to rub and massage my feet while the spray dried too quickly for that. After a well expected long day out, I settled into my hotel room and tried out the wipes. My feet were very tired and hot, as I knew they would be. The moment the cool, soft wipe hit my skin, it was instant relief. I massaged each foot, enjoying the nice minty-tea tree smell, and loving the cool tingle it gave my feet. Not only did my feet feel refreshed and cool afterward, they felt very clean. tree lotion, and went to bed. While I might have expected my feet to ache all night from the amount of walking I did, they were quite comfortable and I slept well– ready to go with all new energy the next morning. I used the wipes every night on that trip. It was amazing how much they helped. it actually helped that too. I love the ingredients in these products. Tea tree oil is an excellent antibacterial and anti-fungal, making it perfect for foot treatments– and without using harsh chemicals and drugs. The fragrance is refreshing and clean, and doesn’t linger long enough to interfere with other scents you might be using. This is a great addition to any foot care collection, and especially helpful when traveling. I highly recommend this one if you may need some help with tired feet any time in the near future.